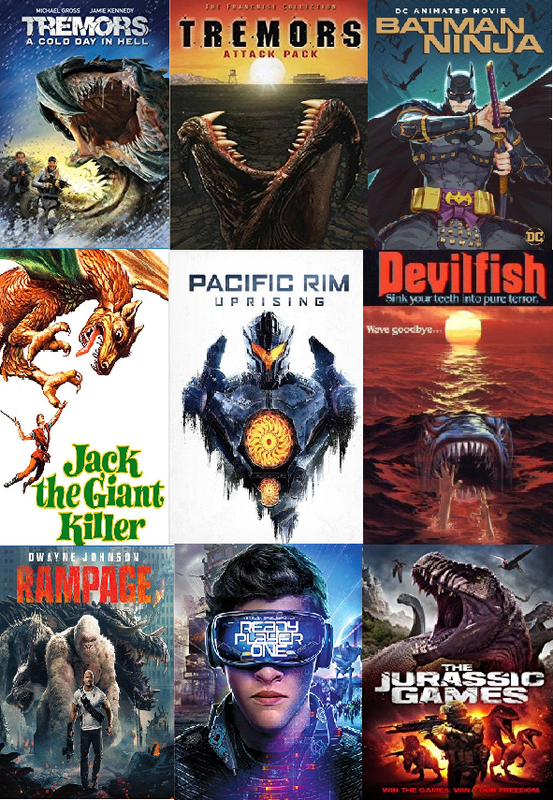 Here are some recent Blu-ray releases that as a Kaiju fan interest me most are monster movies that I would like to check out. Last month in April we saw the release of Tremors: A Cold Day in Hell this is the 6th entry in the Tremors series I myself have not seen the 5th but have heard a lot of positive things about it you can . It is a shame Syfy didn't go forward with the TV series it looked great. We also got the Tremors: Attack Pack which is a Blu-Ray bundle of the original 4 movies all of them are great but nothing tops the first. Here is the link to Tremors: Bloodlines if you want the complete collection. Another release from last month that you might find surprising to find here is Batman Ninja, that is right Batman! This twist on Batman was great but also extremely campy the final battle scene is basically a Megazord vs Ultraman kind of scenario no joke worth the watch. We also saw reprinting of the Jurassic Park series on Blu-ray but those are nothing new and never went away. This month of June we have Pacific Rim: Uprising which is a movie I really enjoyed in theaters and will be getting. I really hope we get a final entry to the series straight to Blu-Ray, animated or even an animated series would be great to give us a conclusion to the story. This month we also saw the release of Jack the Giant Killer on Blu-ray for the first time not to be confused with the 2013 movie Jack the Giant Slayer, this 1962s movie has a few giant creatures that I think will be enough to grab the attention of a monster movie fan like me. Next month in July we will see the release of Devil Fish aka Monster Shark on July 3rd, I have never seen this movie but from the trailer and reviews I can tell this 1984 movie that is the original Sharktopus is going to have plenty of cheese, and terrible acting,but hey I will find it somewhere eventually to watch it for the laughs and the monster. On July 17th Rampage will hit Blu-ray and I am ashamed to say I did not get to see this in theaters but will be watching it immediately when I get it. I hear nothing but positive things about Rampage and it is movie I have waited a long time for. On July 24th while not really a monster movie we will get the release of Ready Player One this is another one I did not get to see in theaters but I hear it has an epic MechaGodzilla battle scene it so you have me sold there. And for my final mention for this post on July 3rd if Devil Fish was not cheesy enough for you we have the Hunger Games/Deathrace/Ready Player One/Jurassic Park hybrid movie The Jurassic Games . That is s right! we have 10 convicts competing for survival in a virtual reality dinosaur where the last convict standing will get freedom, and fame.